Future generations rely upon our wisdom and actions today. 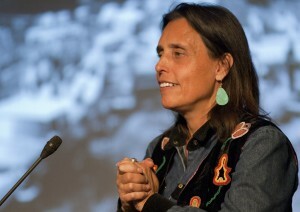 LaDuke will share stories from her work in local food, energy justice, intergenerational and interspecies equity, and the front lines of food sovereignty. This program is sponsored by the Clarke Forum for Contemporary Issues and co-sponsored by the Center for Sustainability Education. It is also part of the Clarke Forum’s semester theme, Food.